Music Hall’s new USB-1 is a convenient, easy to use, and fun turntable. It’s a snap to set up and comes with everything you need to start spinning vinyl. Whether you’re looking to digitize and download your record collection, release your inner DJ, or simply discover the joy of spinning vinyl, the usb-1 is your answer. It has a built-in phono preamp, cartridge, dust cover, and includes all necessary cables and software required for simple plug and play operation. The Music Hall MMF-2.3 Turntable is a 2-speed, belt driven audiophile turntable at a budget price. It is constructed using high quality components and it comes complete with a tonearm and cartridge mounted. The construction of the MMF-2.3 has been simplified to focus on the critical components: the bearing, the motor, and the tonearm. 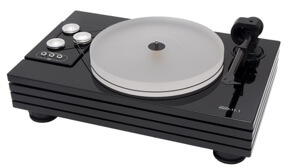 The Music Hall MMF-2.2 Turntable is a 2-speed, belt driven audiophile turntable at a budget price. It is constructed using high quality components and it comes complete with a tonearm and cartridge mounted. The construction of the MMF-2.3 has been simplified to focus on the critical components: the bearing, the motor, and the tonearm. The Music Hall MMF-2.2 Limited Edition Turntable is a 2-speed, belt driven audiophile turntable with special Ferrari Red Plinth at a budget price. It is constructed using high quality components and it comes complete with a tonearm and cartridge mounted. The construction of the MMF-2.3 has been simplified to focus on the critical components: the bearing, the motor, and the tonearm. The Music Hall MMF-2.2 White Turntable is a 2-speed, belt driven audiophile turntable with special High Gloss White Plinth at a budget price. It is constructed using high quality components and it comes complete with a tonearm and cartridge mounted. The construction of the MMF-2.3 has been simplified to focus on the critical components: the bearing, the motor, and the tonearm. The Music Hall MMF-5.3 Turntable is a 2-Speed, belt driven audiophile turntable employing the unique dual-plinth construction originated by Music Hall. The distinctive design isolates the critical sound reproducing components; platter, main bearing, tonearm, and cartridge on the top platform from the motor, switch, wiring, and feet which are mounted on the bottom platform. Viso-Elastic cones separate the two platforms and provide vibration damping. The MMF-5.3 comes complete with an Ortofon 2M Blue Cartridge. The Music Hall MMF-5.3SE Special Edition is a significant upgrade over the standard MMF-5.3. The special edition includes upgrades to the following critical components: vibration damping system, cartridge, and plinth. The distinctive design isolates the critical sound reproducing components: platter, main bearing, tonearm, and cartridge on the top platform from the motor, switch, wiring, and feet which are mounted on the bottom platform. Sorbothane hemispheres separate the two platforms and provide suspension and vibration damping. The Music Hall MMF-5.1 turntable is a two speed belt driven audiophile turntable employing the unique dual-plinth construction originated by Music Hall. The distinctive design isolates the critical sound reproducing components platter, mainbearing, tonearm, and cartridge on the top platform from the motor, switch, wiring, and feet which are mounted on the bottom platform. Viso-Elastic cones separate the two platforms and provide vibration damping. The MMF-5.1 comes complete with Music Hall’s Magic 3 Cartridge mounted. The Magic 3 is specially built by Ortofon for Music Hall. The Music Hall MMF-5.1 LE Turntable is a 2-speed, belt driven audiophile turntable employing the unique dual-plinth construction originated by Music Hall. The distinctive design isolates the critical sound reproducing components platter, main bearing, tonearm, and cartridge on the top platform from the motor, switch, wiring, and feet which are mounted on the bottom platform. Viso-elastic cones separate the two platforms and provide vibration damping. The MMF 5.1LE comes complete with Music Hall Magic 3 cartridge mounted. The Magic 3 is specially built by Ortofon for Music Hall. The Music Hall MMF-5.1 WH Turntable is a 2-speed belt driven audiophile turntable employing the unique dual-plinth construction originated by Music Hall. The distinctive design isolates the critical sound reproducing components; platter, main bearing, tonearm, and cartridge on the top platform from the motor, switch, wiring, and feet which are mounted on the bottom platform. Viso-elastic cones separate the two platforms and provide vibration damping. The MMF-5.1WH comes complete with Music Hall Magic 3 Cartridge Mounted. The Magic 3 is specially built by Ortofon for Music Hall. The Music Hall MMF-5.1 Special Edition is a significant upgrade over the Standard MMF-5.1. The Special Edition includes upgrades to the following critical components: vibration damping system, cartridge, and plinth. The MMF-5.1 SE – like the MMF-5.1—is a 2-speed belt driven audiophile turntable employing Music Hall’s unique dual-plinth construction. The distinctive design isolates the key sound reproducing components; platter, main bearing, tonearm, and cartridge on the top platform from the motor, switch, wiring, and feet which are mounted on the bottom platform. Sorbothane orbs separate the two platforms and provide vibration damping. The MMF-5.1SE comes complete with the Music Hall Mojo Cartridge mounted. The Mojo is specially built by Ortofon for Music Hall. Designed and developed in the USA, the ikura represents a distinct visual and technical design departure for Music Hall. For the first time, music hall collaborated with an outside industrial design firm to develop and complete the project. The foundation of ikura’s design remains the unique two-piece split-plinth design originated by music hall and the final product is the result of a dynamic design partnership between Doing & Done, headed by designer James Kyroudis, and music hall. The mdf (medium density fiberboard) platter and felt mat sit on a high quality, stainless steel ball bearing sheathed in Teflon providing fluid and noise-free operation. The bearing assembly comes pre-charged with lubricant. The effective length of the tonearm is nine inches. This allows for a very shallow tracking arc on the record thus reducing distortion and record wear. The tonearm comes mounted with a high quality moving magnet cartridge and features Swiss made ABEC 7 stainless steel bearings. Each element of the ikura was carefully selected to provide you with the highest level of performance and sound quality. Used properly, the ikura will provide you with years of musical enjoyment. The Music Hall ikura Turntable is a 2-speed, belt driven turntable with many singular features. Starting with Music Hall’s Hallmark two piece split-plinth design. The plinths are isolated and separated by 3 vulcanized rubber cones. Three adjustable conical feet, a 2 speed DC synchronous motor, power switch, wiring and electrical parts are all mounted on the bottom plinth while the critical sound reproducing components; the main bearing, arm and cartridge are mounted on the top plinth. Designed and developed in the USA, the ikura represents a distinct visual and technical design departure for Music Hall. For the first time, music hall collaborated with an outside industrial design firm to develop and complete the project. The foundation of ikura’s design remains the unique two-piece split-plinth design originated by music hall and the final product is the result of a dynamic design partnership between Doing & Done, headed by designer James Kyroudis, and music hall. The mdf (medium density fiberboard) platter and felt mat sit on a high quality, stainless steel ball bearing sheathed in Teflon providing fluid and noise-free operation. The bearing assembly comes pre-charged with lubricant. The effective length of the tonearm is nine inches. This allows for a very shallow tracking arc on the record thus reducing distortion and record wear. The tonearm comes mounted with a high quality moving magnet cartridge and features Swiss made ABEC 7 stainless steel bearings. Each element of the ikura was carefully selected to provide you with the highest level of performance and sound quality. Used properly, the ikura will provide you with years of musical enjoyment. The Music Hall ikura turntable is a 2-speed, belt driven turntable with many singular features. Starting with Music Hall’s Hallmark two piece split-plinth design. The Plinths are isolated and separated by three vulcanized rubber cones. Three adjustable conical feet, a 2 speed DC synchronous motor, power switch, wiring and electrical parts are all mounted on the bottom plinth while the critical sound reproducing components; the main bearing, arm and cartridge are mounted on the top plinth. The Music Hall MMF-7.3 Turntable is a 2-speed belt driven audiophile turntable employing the unique dual-plinth construction originated by Music Hall. The distinctive design of the mmf-7.3 isolates the critical sound reproducing components; platter, main bearing, tonearm, and cartridge on the top platform from the adjustable tip-toe feet which are mounted on the bottom platform. The motor speed controls, and wiring are isolated on their own platform and completely decoupled from the turntable. Sorbothane hemispheres separate the two platforms and provide additional suspension and vibration damping. The MMF-7.3 comes in a high-gloss piano black lacquer finish and is available with or without the Ortofon 2m Bronze cartridge. The Music Hall MMF-7.1 turntable is a two speed belt driven audiophile turntable employing the unique dual-plinth construction originated by Music Hall. The distinctive design isolates the critical sound reproducing components; platter, main bearing, tonearm, and cartridge on the top platform from the adjustable tip toe feet which are mounted on the bottom platform. Sorbothane hemispheres separate the two platforms and provide additional vibration damping. The motor, switch, and wiring are completely decoupled from the turntable and isolated on their own vibration damping puck. The MMF-7.1 comes in a high gloss piano black lacquer finish and is available with or without the Music Hall Mojo cartridge. The Mojo is specially built by Ortofon for Music Hall. The Music Hall MMF-9.3 turntable, is a two speed, belt driven audiophile turntable employing the unique triple plinth construction originated by Music Hall. The distinctive design isolates the critical sound reproducing components: platter, main bearing, tonearm, and cartridge, on the top platform, from the adjustable tip-toe feet and wiring, which are mounted on the bottom platform. The motor and speed controls are isolated on their own vibration damping base and completely decoupled from the turntable. Sorbothane hemispheres separate each of the three platforms and provide additional suspension and vibration damping. The MMF-9.3 comes in a high-gloss piano black lacquer finish and is available with or without cartridge. The Music Hall MMF-9.1 Turntable, is a two speed, belt driven audiophile turntable employing the unique triple plinth construction originated by Music Hall. The distinctive design isolates the critical sound reproducing components: platter, main bearing, tonearm, and cartridge on the top platform from the adjustable tip toe feet, electronic speed control, and wiring which are mounted on the bottom platform. Sorbothane hemispheres separate each of the three plinths and provide additional vibration damping. The motor and switch are isolated on their own vibration damping base and completely decoupled from the turntable. The MMF-9.1 comes in a high gloss piano black lacquer finish and is available with or without cartridge. The Music Hall MMF-11.1 Turntable, our latest flagship, is a two speed belt-driven audiophile turntable, featuring the unique quadruple-plinth construction originated by Music Hall. The distinctive design isolates the critical sound reproducing components, each on their own plinth. 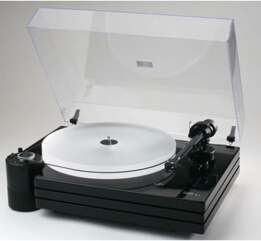 The tonearm is mounted to the upper plinth and the inverted ceramic main bearing is mounted to the second plinth allowing the partially sunken 1 1/2″ acrylic platter to spin freely. Moving the main bearing to the second plinth improved cartridge tracking and significantly lowered background noise. The adjustable magnetic-levitation isolation feet, microprocessor speed control, motors, flywheel, and wiring are all mounted to the bottom plinth. The motors, flywheel, and speed control are further isolated on their own vibration damped dual-plinth platform, which is separately isolated from the upper three main plinths. Sorbothane hemispheres separate each of the three main plinths and provide additional vibration damping. The bottom plinth functions as a mass-loaded resonant sink for the entire turntable. Two motors and a flywheel are used to increase torque and speed stability. The mmf-11.1 comes in a high-gloss piano black lacquer finish and ships without cartridge. A large encapsulating acrylic dustcover is included.